Seems like the folks at the iPhone5Mod are not messing around. Last year, the Chinese firm released a Flash Lightning Dock, which allowed Apple's Lightning cable to be replaced with cheaper vendor versions, which definitely didn't make the latter happy. Now, iPhone5Mod has announced that it has made its way into Apple iOS 7's authentication and will be offering cheaper cables on the market that will be compatible with the new version of the platform. According to Cyril Chang, who is working at the Chinese firm, in order for Apple to fix that issue it has to change its own Lightning cable hardware, since the cheaper version was made accessible via a hardware crack. Don't know what's Apple's problem to seek monopoly on everything. Standard MicroUSB isn't bad at all. If they want to be special then consider providing USB 3.0 support, instead of wasting resources on something strange like custom ports. Nokia, SS, LG, Sony everybody has long left the idea of custom ports. Money, that's why. Apple squeezes every little cent, they get everything out of their potential. It also adds the feel of exclusivity and a premium feel for the consumers. It's Apple subtle yet clever qualities that make them so popular and praised. Even someone said that cheap iPhone won't be that cheap. In other words, less bang for the buck. Heck, even Apple shareholders don't want the cheap version of iPhone. That kind of company Apple is. They have my respect of innovating many new things (must agree) but there must be something wrong they've done as now they are seeking for Fire Exit doors. What exclusivity feel? The world is full of Apple products. More like seeking monopol and money squeezing. lolol! I guess that might be true!! disagreeing with you on this matter! thunderbolt used by apple is quite amazing and it smashes USB 3.0 it just doesn't have enough support and that is it's problem even USB 3.0 hasn't been mass produced yet ! Aren't we talking about Lightning cable here? Isn't PA a site for mobile devices? Thunderbolt is out of equation on mobile devices. This is news because now even though iOS 7 was going to put a lockdownon aftermarket cables. (Which is extremely stupid. This kind of crap is why i hate Apple.) 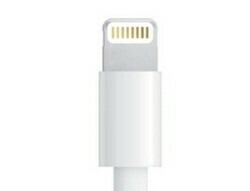 We can now expect cheaper Aftermarket cables that will work on iOS 7. There's a pop up for that.